Cardioembolic stroke is a major cause of morbidity and mortality in patients with atrial fibrillation (AF). The left atrial appendage (LAA) is the prominent source of clot formation. While systemic anticoagulation is the current standard of care, anticoagulants carry many contraindications and possible complications. Techniques for elimination of the LAA are in various stages of development and early clinical use. In the coming years, accumulating data will help guide the management of AF patients at risk of bleeding as well as potentially become first-line therapy to reduce the risk of thromboembolic stroke. The purpose of this article is to review current endovascular and epicardial catheter-based LAA occlusion devices and the clinical data supporting their use. Sunil Kapur has no conflicts of interest to declare. Moussa Mansour is a consultant at St Jude Medical. Atrial fibrillation (AF) is the most common cardiac arrhythmia, affecting more than three million Americans.1 The management of AF revolves around the alleviation of symptoms related to an accelerated and irregular ventricular response, and the prevention of cardioembolism, notably stroke. In patients with AF, there is a fivefold increased incidence of embolic stroke.2 The prevention of systemic embolism has seen significant progression with the recent development of novel oral anticoagulants. However, these medications are associated with poor compliance leaving many patients with AF without systemic anticoagulation. A recent meta-analysis highlighted the current issues with pharmacological prophylaxis in AF.3 Of the 29,272 participants who received warfarin as part of a randomised, phase III trial, the median time in therapeutic ranged from 58 % to 68 %. The event of stroke or systemic embolisation with all-comers on warfarin occurred in 1,107 out of 29,229 patients or 3.8 %. Even with all novel oral anticoagulants, this outcome occurred in 911 out of 29,312 patients or 3.1 %. Even more concerning, major bleeding occurred in 1,541 and 1,802 patients on novel anticoagulants and warfarin, respectively. These are discouraging data, as the devastating side effect of major bleeding outpaces the outcome (stroke or systemic embolisation) we are primarily trying to prevent. Ideally, prophylaxis would effectively limit the embolisation risk without the glaring side effect of bleeding complications. It is for this reason that non-pharmacological prevention of embolism has garnered interest. Among patients with non-valvular AF, the majority of thrombi are located within the left atrial appendage (LAA). As such, non-pharmacological therapy has centred on occlusion, obliteration or removal of the LAA. The LAA empties into the left atrium through an orifice located between the left upper pulmonary vein and the left ventricle.4 Its unique anatomy, often multilobulated and trabeculated, allows predisposition to in situ thrombus formation. Studies using various imaging modalities demonstrate significant heterogeneity in LAA morphology,5–7 which complicates mechanical occlusion of the appendage. The physiological role of the LAA is incompletely understood, but is likely important in natriuresis and volume regulation.8 However, pathophysiological descriptions of the LAA, is a source of embolism in AF, are well described and date back to the 1940s.9 Review of human data hassuggested that at least 90 % of left atrial thrombi are found within the LAA.10 As such, the concept of LAA modification as a method to reduce thromboembolism has arisen. A variety of surgical techniques have been described to close the LAA, with various degrees of efficacy.11 In the 1990s, interest was increased with the inclusion of atrial appendage removal at the time of Maze procedure.12 A retrospective study of 205 patients who underwent mitral valve replacement, analysed a group of 58 patients in which LAA ligation was performed. After almost six years, the incidence of an embolic event in those with LAA ligation was significantly lower than in those without this procedure (3 versus 17 %).13 The Left Atrial Appendage Occlusion Study (LAAOS), the first randomised trial of surgical LAA occlusion, in patients referred for coronary bypass surgery at risk for AF or ischaemic stroke, concluded that surgical exclusion of the LAA was safe and did not increase operative time or peri-operative bleeding.14 However, oversewing the appendage without amputation produced successful exclusion in only 45 % of patients. This rate onlyincreased to 72 % if a stapler device was used. In recent years, Interest in the LAA has been driven by the development in percutaneous occlusion devices. The lack of efficacy of open exclusion underlies the significant difficulty that percutaneous exclusion devices will also face. The percutaneous devices are divided into two fundamental delivery techniques – endocardial and epicardial approaches. Three devices have been investigated: the Percutaneous LeftAtrial Appendage Transcatheter Occlusion (PLAATO) system, the Amplatzer™ Cardiac Plug and the WATCHMAN™ device. All are delivered percutaneously through transseptal access to the left atrium (LA). In 2001 the PLAATO system was the first device of its kind used in humans. It was withdrawn by the manufacture for commercial reasons. Its details highlight the evolution of the LAA occlusion technology. The PLAATO system was a self-expandable nitinol cage with a polytetrafluoroethylene membrane. The purpose of the membrane is both to occlude the orifice of the LAA and to allow tissue incorporation into the device. Small anchors along the struts and passing through the occlusive membrane assist with device anchoring and encourage healing response. The device is delivered through a custom 14 French (Fr) transseptal sheath curved to point at the LAA. PLAATO implantation was described in 15 patients with persistent AF and contraindications to oral anticoagulant therapy in 2002.15 Subsequently, an international multicentre registry of 111 patients with contraindication to oral anticoagulation was published.16 In this cohort, device implantation was 97 % successful, and LAA occlusion was documented in 98 % of patients at the six-month follow-up transoesophageal echocardiogram (TOE). There were seven major adverse events, including one death and two strokes, at a mean follow-up of 9.8 months. The stroke rate of 2.2 % per year compared with the estimated annual stroke rate of 6.3 % for this population, representing a 65.0 % relative reduction in stroke. Another small series17 of 20 patients with non-valvular AF documented LAA closure using the PLAATO system. All patients had contraindications to anticoagulant therapy and were at high-risk for cardioembolic stroke (mean CHADS2 score 3.0 ± 1.2). Eighteen patients had successful implant, while in two patients closure was not feasible for the presence of a multilobed LAA. In one patient, the procedure was complicated by cardiac perforation with pericardial effusion, treated with pericardiocentesis. At a mean follow-up of 40 ± 10 months, no embolic events occurred. A larger series of patients treated with the PLAATO device was in a single German centre. Percutaneous LAA closure was performed in 71 patients with a contraindication to anticoagulation or history of stroke under anticoagulant therapy.18 In a mean follow-up of 24 months, one minor stroke was reported (1.4 %), a lower rate than the 5.0 % predicted on the basis of a mean CHADS2 score of 2.5. One device embolisation occurred, occluding the left ventricular outflow tract, resulting in the patient’s death, and there was one case of deviceinstability requiring removal by open surgery. Later trials with the device showed similar success. A European study reported on 180 patients with non-rheumatic AF and a contraindication to warfarin, who were treated with the device.19 Placement was successful in 90 % of patients. Two patients died within 24 hoursof the procedure (1.1 %) and six patients had cardiac tamponade (3.3 %), with two requiring surgical drainage. During a follow-up of 129 patient-years, there were three strokes, for a rate of 2.3 % per year. The five-year North American results consisted of 64 patients who were similarly at high-risk of stroke (mean congestive heart failure, hypertension, age, diabetes mellitus, prior stroke or transient ischaemic attack [CHADS2] score 2.6) and were not oral anticoagulation candidates.20 Device implantation success was 98 % by core laboratory TOE. In comparison with historical controls, with an expected 6.6 % stroke rate, the PLAATO device in this trial showed a 3.8 % stroke rate or a 42.0 % relative risk reduction. The PLAATO experience demonstrated that in a non-randomised cohort, device implantation is feasible. When compared with the stroke risk estimated using the CHADS2 score, the device reduced the stroke rate from 40 % to 65 % in higher risk AF patients with contraindications to anticoagulation. The WATCHMAN LAA closure device began its use in humans after the PLAATO device. The WATCHMAN LAA system is a self-expanding nickel titanium (nitinol) device (see Figure 1A). It contains a polyester covering and fixation barbs for attachment. Like the PLAATO system, implantation is performed percutaneously through venous access and transseptal puncture. In the initial clinical experience, following implantation, patients are anticoagulated with warfarin or alternate agents for approximately 45 days, as the fabric requires time for sealing. After this period, patients are maintained on antiplateletagents indefinitely. The WATCHMAN device is the only LAA closure device studied in randomised clinical studies. Given the need for anticoagulation peri-implantation, data for the WATCHMAN device consist of trials with patients that have no contraindications to anticoagulation. This is thought provoking, as it may suggest a future role for first-line therapy in AF patients as opposed to lifelong anticoagulation. The seminal clinical trial with the WATCHMAN device is the Left Atrial Appendage System for Embolic Protection in Patients with Atrial Fibrillation (PROTECT-AF) trial.21 The population was at somewhat lower cardioembolic risk, with a mean CHADS2 mean score of 2.17. The study had a non-inferiority design and randomised 707 patients with non-valvular AF worldwide to the WATCHMAN device or warfarin therapy in a 2:1 fashion. A primary composite endpoint consisted of stroke, cardiovascular death and systemic embolism. If the TOE at 45 days showed minimal flow in the LAA and no thrombus or clinical endpoints, then warfarin was discontinued with aspirin/ clopidogrel to six-months, followed by aspirin alone. At 45 days, 86 % of the WATCHMAN device patients had documented closure and were able to stop warfarin. This increased to 92 % at six months. In the WATCHMAN group, there was a 38 % reduction in primary efficacy,29 % in stroke and 38 % in death compared with the warfarin control group. Meanwhile, there was a 77 % increase in primary safety events in the WATCHMAN group. Procedural complications occurred in a relatively high percentage – 49 of 453 (10.6 %) of the device cohort. The control group had a 6.6 % (16 of 244) adverse event rate,which consisted of major bleeding (4.3 %) and haemorrhagic stroke (2.5 %). The PROTECT-AF trial demonstrated the non-inferiority of the WATCHMAN device compared with standard therapy with warfarin, but concerns of safety of implantation remained. The Prospective Randomized Evaluation of the Watchman LAA Closure Device in Patients with Atrial Fibrillation Version Long Term WarfarinTherapy (PREVAIL) study is a more recent evaluation of patients with no contraindications to anticoagulation.24 While still awaiting formal publication, data from the trial have been released. The PREVAIL trial enrolled 407 patients, again randomised in a 2:1 fashion to the device or warfarin. As a result of procedural refinements, the implant success rate in the PREVAIL study was 95.1 %, significantly better than the 90.9 % rate in the PROTECT AF trial. The main safety endpoint – acute (seven-day) occurrence of death, ischaemic stroke, systemic embolism and procedure, or device-related complications requiring major cardiovascular or endovascular intervention – occurred in six out of 269 patients (2.2 %) who received the device. A second, broader, safety endpoint, including cardiac perforation, pericardial effusion with tamponade, ischaemic stroke, device embolisation and other vascular complications, occurred in 4.4 % of patients receiving the WATCHMAN device in the PREVAIL study, compared with 8.7 %in the PROTECT AF study. The observed adverse event rate at 18 months for both the WATCHMAN device and the control was 0.064, resulting in a rate ratio of 1.07, device versus control. The PREVAIL trial also met its pre-specified endpoint for the third co-primary endpoint occurrence of late ischaemic stroke and systemic embolism (>7 days post-randomisation) at 18 months. The observed adverse event rate was 0.0253 per 100 patient-years, resulting in an observed difference between the device and control group of 0.0051 per 100 patient-years. The PROTECT AF and PREVAIL trials demonstrated that LAA closure with the WATCHMAN device was non-inferior to warfarin therapy. However, the PROTECT AF study only included patients that were candidates for warfarin. The ASA Plavix Feasibility Study With Watchman Left Atrial Appendage Closure Technology (ASAP) registry,25 a non-randomised feasibility study, was designed to assess the safety and efficacy of LAA closure in AF patients ineligible for warfarin therapy. The regimen after implant was clopidogrel through six months and aspirin indefinitely. The mean CHADS2 score in the ASAP population was 2.8, which equates to a predicted ischaemic stroke rate of 7.4 % (although assuming no aspirin use). If this expected stroke rate of 7.4 % per year is averaged with data in which aspirin was used, the expected ischaemic stroke of the ASAP population is approximately 7.3 %. The ASAP registry demonstrated that the WATCHMAN device recipients had a 77 % reduction in ischaemic stroke versus aspirin alone, and a 64 % reduction versus aspirin and clopidogrel. It is important to note that incomplete LAA closure is a complication of the device (as with any of the devices). In fact, residual peri-device flow into the LAA after percutaneous closure with the WATCHMAN device was common (~32 % of patients with at least some degree of peri-device flow at 12 months) in the PROTECT AF study.26Other studies have replicated this experience.27 The cardioembolic significance of this remains unclear, as the event rate was exceedingly low in the PROTECT AF study population. The WATCHMAN device has been considered for Food and Drug Administration (FDA) approval based on the results accumulating data. While FDA advisory panels for this topic have voted in favour of approval, the FDA has yet to grant approval at the time of this writing. The Amplatzer septal occluder has been in use for over 15 years, with extensive success in patent foramen ovale and atrial septal defect closure, and is FDA approved for this latter indication. The first human clinical application in LAA occlusion was in 2002. In a series of 16 patients, LAA occlusion was successful in 15, with one instance of device embolisation requiring surgical intervention.28 Subsequently, the Amplatzer Cardiac Plug was developed specifically for LAA occlusion (see Figure 1B). It consists of a self-expanding flexible nitinol mesh with a distal lobe with retaining hooks, a proximal disk, each containing central polyester patch. The mechanism of the lobe and disk for sealing the LAA orifice is termed the ‘pacifier principle’. Few data exist regarding the formation of thrombi on the Amplatzer cardiac plug (ACP), but reports of this exist. In one case, a patient with chronic AF underwent successful percutaneous LAA exclusionand was prescribed clopidogrel for one month and aspirin indefinitely, but TOE at three-month follow-up revealed a thrombus adhering to the device. This resolved with enoxaparin 60 mg twice-daily for six months.32 In January 2011 the manufacturer (at that time AGA Medical) published a Field Safety Notice for all centres implanting the ACP, updating the instructions for use, stating that the most likely cause for thrombus formation on the device was excessively deep implantation. They recommended aspirin for six months post-implant. Data also exist on the late outcomes after LAA closure in patients with absolute contraindications to warfarin. A recently published small trial followed a total of 52 patients who underwent Amplatzer LAA closure.33 Most patients received short-term (1–3 months) dual antiplatelet therapy after the procedure and single antiplatelet therapy thereafter. The procedure was successful in 98.1 % of the patients, and the main complications were device embolisation (1.9 %) and pericardial effusion (1.9 %), with no cases of peri-procedural stroke. At a mean follow-up of 20 ± 5 months, the rates of death, stroke, systemic embolism, pericardial effusion and major bleeding were 5.8 %, 1.9 %, 0.0 %, 1.9 % and 1.9 %, respectively. The presence of mild peri-device leak was observed in 16.2 % of patients at the six-month follow-up as evaluated by TOE. There were no cases of device thrombosis. These data suggest that the Amplatzer device followed by dual/single antiplatelet therapy may be associated with a low rate of embolic and bleeding events in intermediate length follow-up. Observational data regarding cardioembolic effects are limited. One prospective observational report followed a total of 197 patients who were not candidates for anticoagulation and underwent ACP implantation at one of 15 investigative centres in Europe in 2009 to 2011.34 The stroke rate was 1.98 % at 101 patient-years compared with a CHADS2 prediction of 5.60 %. The Amplatzer device does not have FDA approval for LAA closure. Recent variations on the device have been made to help with implantation, now known as the AMPLATZER™ Amulet™ Left Atrial Appendage Occluder.35 A randomised clinical study comparing the efficacy of the ACP device versus warfarin enrolled its first patient in March 2013. The Amulet device is not approved for use in the US. In Europe the use of the device has been temporarily suspended. The Coherex WaveCrest36 is a developing device (see Figure 1C). Purportedly, the WaveCrest device is designed to improve confidence in clinical outcomes through an ability to better control placement with retractable anchors, better visualise closure, position and stability as well as material that allows for rapid endothelization. This highlights the potential areas for advancement in endocardial LAA occlusion. Coherex has received CE Mark approval for the WaveCrest and expects to begin commercialisation outside the US. The Cardia Ultrasept,37 Lifetech LAmbre™38 and Occlutech®39 devices are also in varying stages of development in this rich space. Two devices in various stages of development involve a transcatheter transpericardial technique – the LARIAT® Suture Delivery Device and the Aegis electrocardiogram-guided LAA capture and ligation system. The LARIAT Suture Delivery Device uses transseptal placement of a temporary balloon in the LAA, two magnet-tipped guidewires inserted endocardialy into the LAA and the pericardial space, and a closure snare device (see Figure 1D). A radiopaque suture loop captures the LAA. Due to the need for pericardial access, patients with potential adhesions such as those with a history of cardiac surgery or pericarditis are not ideal candidates for the procedure. However, the LARIAT procedure does not require the use of peri-procedural anticoagulation therapy. This device demonstrated successful LAA closure in a canine model, with 100 % successful deployment.40 Early data showed the feasibility of the procedure in 13 human patients.41 In 2011, a total of 13 patients undergoing either mitral valve surgery (n=2) or electrophysiological study and radiofrequency catheter ablation for AF (n=11) underwent ligation of the LAA with the LARIAT device. Both mitral valve patients had complete closure by visual inspection; 10 of 11 patients having ablation underwent a successful LAA ligation. Subsequently, larger series have shown further positive results.42 Eighty-five (96 %) of 89 patients underwent successful LAA ligation. Eighty-one of 85 patients had complete closure immediately. Three of 85 patients had a ≤2 mm residual LAA leak, and one of 85 patients had a ≤3 mm jet by TOE colour Doppler evaluation. There were no complications due to the device. There were three access-related complications, all conservatively managed without any patient requiring surgery. Adverse events included severe pericarditis post-operatively (n=2), late pericardial effusion (n=1), unexplained sudden death more than six months after the procedure (n=2) and late strokes thought to be non-embolic also occurring more than six months after the procedure (n=2). At one-month (81 of 85) andthree-months (77 of 81) post-ligation, 95 % of the patients had complete LAA closure by TOE. Of the patients undergoing one-year TOE (n=65), there was 98 % complete LAA closure, including the patients with previous leaks. The LARIAT is approved in Europe and was approved by the FDA in 2009. Data regarding its efficacy in cardioembolic reductionare accumulating. The Aegis system is an epicardial electrocardiogram-guided LAA capture and ligation system. It permits LAA closure in the closed pericardial space with a single sheath puncture. It has two components – an appendage grasper and a ligator. An atrial electrogram recorded between the two jaws identifies the tissue captured as atrial myocardium, thus distinguishing the LAA from epicardial fat and ventricular tissue. Additional recordings permit identification of the grasper’s position relative to electrically active cardiac tissue. Beyond TOE guidance, once the system is positioned near the LAA, injection of contrast outlines the LAA. The second component is a ligator/hollow suture to provide mechanical support and for fluoroscopic visualisation. Once the loop is in position it iscinched down, occluding the LAA, after which the wire is removed leaving only the suture behind. The loop can be repeatedly opened and closed until capture is achieved. An initial suture can also be used as a guide for more proximal sutures. Further studies have shown improving results on an intermediate basis.43 Human data are not available to date. The LAA is a prominent source of cardioembolism. Systemic anticoagulation to treat what may be largely a localised phenomenon is associated with significant complications. These challenges have led to interest in mechanical exclusion of the LAA. In this paper, we reviewed the current state of percutaneous left atrial exclusion for stroke prevention in AF, including transspetal endovascular and percutaneous epicardial devices. Early data from both categories is promising. There is accumulating data in both patients with contraindications to anticoagulation as well as those who have no contraindications. The availability of several approaches will allow physician selection of the optimal approach for a given patient based on clinical, physiological and anatomical considerations. Roger VL, Go AS, Lloyd-Jones DM, et al. Heart disease and stroke statistics–2011 update: a report from the American Heart Association. Circulation 2011;123(4):e18–209. Wolf PA, Abbott RD, Kannel WB. Atrial fibrillation: a major contributor to stroke in the elderly. The Framingham Study. Arch Intern Med 1987;147(9):1561–4. Ruff CT, Giugliano RP, Braunwald E, et al. Comparison of the efficacy and safety of new oral anticoagulants with warfarin in patients with atrial fibrillation: a meta-analysis of randomised trials. Lancet 2014;383(9921):955–62. Su P, McCarthy KP, Ho SY. Occluding the left atrial appendage: anatomical considerations. Heart 2008;94(9):1166–70. Heist EK, Refaat M, Danik SB, et al. Analysis of the left atrial appendage by magnetic resonance angiography in patients with atrial fibrillation. Heart Rhythm 2006;3(11):1313–8. Al-Saady NM, Obel OA, Camm AJ. Left atrial appendage: structure, function, and role in thromboembolism. Heart 1999;82(5):547–54. Agmon Y, Khandheria BK, Gentile F, Seward JB. Echocardiographic assessment of the left atrial appendage. J Am Coll Cardiol 1999;34(7):1867–77. Tabata T, Oki T, Yamada H, et al. Relationship between left atrial appendage function and plasma concentration of atrial natriuretic peptide. Eur J Echocardiogr 2000;1(2):130–7. Madden JL. Resection of the left auricular appendix; a prophylaxis for recurrent arterial emboli. J Am Med Assoc 1949;140(9):769–72. Manning WJ. Atrial fibrillation, transesophageal echo, electrical cardioversion, and anticoagulation. Clin Cardiol 1995;18(2):58,114. Blackshear JL, Odell JA. Appendage obliteration to reduce stroke in cardiac surgical patients with atrial fibrillation. Ann Thorac Surg 1996;61(2):755–9. Cox JL. Surgical treatment of atrial fibrillation: a review. Europace 2004;5 Suppl 1:S20–9. García-Fernández MA, Pérez-David E, Quiles J, et al. Role of left atrial appendage obliteration in stroke reduction in patients with mitral valve prosthesis: a transesophageal echocardiographic study. J Am Coll Cardiol 2003;42(7):1253–8. Healey JS, Crystal E, Lamy A, et al. Left Atrial Appendage Occlusion Study (LAAOS): results of a randomized controlled pilot study of left atrial appendage occlusion during coronary bypass surgery in patients at risk for stroke. Am Heart J 2005;150(2):288–93. Sievert H, Lesh MD, Trepels T, et al. Percutaneous left atrial appendage transcatheter occlusion to prevent stroke in highrisk patients with atrial fibrillation: early clinical experience. Circulation 2002;105(16):1887–9. Ostermayer SH, Reisman M, Kramer PH, et al. Percutaneous left atrial appendage transcatheter occlusion (PLAATO system) to prevent stroke in high-risk patients with nonrheumatic atrial fibrillation: results from the international multi-center feasibility trials. J Am Coll Cardiol 2005;46(1):9–14. Ussia GP, Mulè M, Cammalleri V, et al. Percutaneous closure of left atrial appendage to prevent embolic events in high-risk patients with chronic atrial fibrillation. Catheter Cardiovasc Interv 2009;74(2):217–22. Park JW, Leithäuser B, Gerk U, et al. Percutaneous left atrial appendage transcatheter occlusion (PLAATO) for stroke prevention in atrial fibrillation: 2-year outcomes. J Invasive Cardiol 2009;21(9):446–50. Bayard YL, Omran H, Neuzil P, et al. PLAATO (Percutaneous Left Atrial Appendage Transcatheter Occlusion) for prevention of cardioembolic stroke in non-anticoagulation eligible atrial fibrillation patients: results from the European PLAATO study. EuroIntervention 2010;6(2):220–6. Block PC, Burstein S, Casale PN, et al. Percutaneous left atrial appendage occlusion for patients in atrial fibrillation suboptimal for warfarin therapy: 5-year results of the PLAATO (Percutaneous Left Atrial Appendage Transcatheter Occlusion) Study. JACC Cardiovasc Interv 2009;2(7):594–600. Holmes DR, Reddy VY, Turi ZG, et al. Percutaneous closure of the left atrial appendage versus warfarin therapy for prevention of stroke in patients with atrial fibrillation: a randomised non-inferiority trial. Lancet 2009; 374(9689):534–42. Reddy VY, Holmes D, Doshi SK, et al. 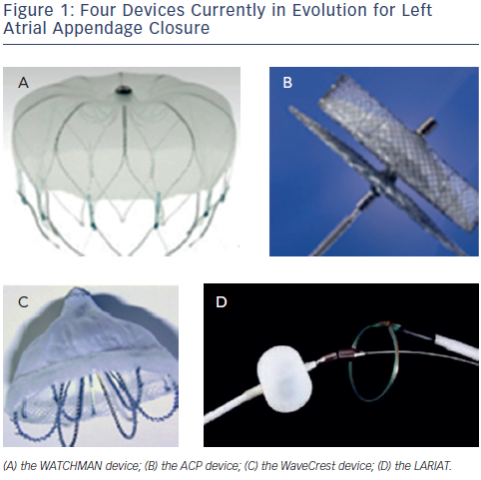 Safety of percutaneous left atrial appendage closure: results from the Watchman Left Atrial Appendage System for Embolic Protection in Patients with AF (PROTECT AF) clinical trial and the Continued Access Registry. Circulation 2011;123(4):417–24. Meier B, Palacios I, Windecker S, et al. Transcatheter left atrial appendage occlusion with Amplatzer devices to obviate anticoagulation in patients with atrial fibrillation. Catheter Cardiovasc Interv 2003;60(3):417–22. Holmes DR, Doshi S, Kar S, et al. Presentation. Final results of randomised trial of left atrial appendage closure versus warfarin for stroke/thromboembolic prevention in patients with nonvalvular atrial fibrillation. American College of Cardiology Annual Scientific Session 2013, San Fransisco, US. Reddy VY, Möbius-Winkler S, Miller MA, et al. Left atrial appendage closure with the Watchman device in patients with a contraindication for oral anticoagulation: the ASAP study (ASA Plavix Feasibility Study With Watchman Left Atrial Appendage Closure Technology). J Am Coll Cardiol 2013;61(25):2551–6. Viles-Gonzalez JF, Kar S, Douglas P, et al. The clinical impact of incomplete left atrial appendage closure with the Watchman Device in patients with atrial fibrillation: a PROTECT AF (Percutaneous Closure of the Left Atrial Appendage Versus Warfarin Therapy for Prevention of Stroke in Patients With Atrial Fibrillation) substudy. J Am Coll Cardiol 2012;59(10):923–9. Bai R, Horton RP, DI Biase L, et al. Intraprocedural and longterm incomplete occlusion of the left atrial appendage following placement of the WATCHMAN device: a single center experience. J Cardiovasc Electrophysiol 2012;23(5):455–61. Reddy VY, Doshi SK, Sievert H, et al. Long Term Results of PROTECT AF: The Mortality Effects of Left Atrial Appendage Closure versus Warfarin for Stroke Prophylaxis in AF. Presented at: Heart Rhythm Society 34th Annual Scientific Sessions, Denver, Colorado, US, 9 May 2013. Meerkin D, Butnaru A, Dratva D, et al. Early safety of the Amplatzer Cardiac Plug™ for left atrial appendage occlusion. Int J Cardiol 2013;168(4):3920–5. Park JW, Bethencourt A, Sievert H, et al. Left atrial appendage closure with Amplatzer cardiac plug in atrial fibrillation: initial European experience. Catheter Cardiovasc Interv 2011;77(5):700–6. Lam YY, Yip GW, Yu CM, et al. Left atrial appendage closure with AMPLATZER cardiac plug for stroke prevention in atrial fibrillation: initial Asia-Pacific experience. Catheter Cardiovasc Interv 2012;79(5):794–800. Cruz-Gonzalez I, Martín Moreiras J, García E. Thrombus formation after left atrial appendage exclusion using an Amplatzer cardiac plug device. Catheter Cardiovasc Interv 2011;78(6):970–3. Urena M, Rodés-Cabau J, Freixa X, et al. Percutaneous left atrial appendage closure with the AMPLATZER cardiac plug device in patients with nonvalvular atrial fibrillation and contraindications to anticoagulation therapy. J Am Coll Cardiol 2013;62(2):96–102. Park JW, Sievert H, Schillinger W, et al. TCT-86 Results of the Amplatzer Cardiac Plug European Multicenter Prospective Observational Study. J Am Coll Cardiol 2012;60(17):B27. Freixa X, Chan JL, Tzikas A, et al. The Amplatzer™ Cardiac Plug 2 for left atrial appendage occlusion: novel features and first-in-man experience. EuroIntervention 2013;8(9):1094–8. Coherex Medical. The WaveCrest Solution. Available at: www. coherex.com/finding-a-solution/the-wavecrest-solution/ (accessed 6 April 2014). Cheng Y, Conditt G, Yi G, et al. TCT-765 First In-Vivo Evaluation of the Ultrasept Left Atrial Appendage Closure Device. J Am Coll Cardiol 2012;60(17):B223. Lam YY. A new left atrial appendage occluder (Lifetech LAmbre Device) for stroke prevention in atrial fibrillation. Cardiovasc Revasc Med 2013;14(3):134–6. Kanthan A, Looi KL, Mottram P, et al. Percutaneous left atrial appendage closure using a PFO closure device. Heart Lung Circ 2013;22(9):784–5. Lee RJ, Bartus K, Yakubov SJ, Catheter-based left atrial appendage (LAA) ligation for the prevention of embolic events arising from the LAA: initial experience in a canine model. Circ Cardiovasc Interv 2010;3(3):224–9. Bartus K, Bednarek J, Myc J, et al. Feasibility of closed-chest ligation of the left atrial appendage in humans. Heart Rhythm 2011;8(2):188–93. Bartus K, Han FT, Bednarek J, et al. Percutaneous left atrial appendage suture ligation using the LARIAT device in patients with atrial fibrillation: initial clinical experience. J Am Coll Cardiol 2013;62(2):108–18. Bruce CJ, Stanton CM, Asirvatham SJ, et al. Percutaneous epicardial left atrial appendage closure: intermediate-term results. J Cardiovasc Electrophysiol 2011;22(1):64–70. Slater AD, Foley JL, Phillips L, Francischelli DE. Band occlusion of the atrial appendage. J Card Surg 2010;25(2):156–60. McCarthy PM, Lee R, Foley JL, et al. Occlusion of canine atrial appendage using an expandable silicone band. J Thorac Cardiovasc Surg 2010;140(4):885–9.